The Tapanuli orangutan could go extinct this year. Wildlife didn’t have an easy go of it in 2018. We lost the last male northern white rhino, the vaquita porpoise continued its slide toward extinction, poachers kept targeting pangolins and other rare creatures, and through it all the Trump administration kept trying to whittle away at key protections for endangered species. Well, in most cases it won’t be pretty. There will be more blood, more habitat loss, more legislative attacks and more extinctions — but at the same time, there will also be signs of hope and progress on many levels. Of course, climate change will continue to threaten species around the world in 2019. And new threats continue to emerge. “There’s been a lot of discussion about how global climate change affects ocean acidification, and now there’s emerging evidence that the even greater threat is reduced oxygen levels,” says noted conservationist William Laurance of James Cook University. A study published last month found that ocean deoxygenation could have a major impact on zooplankton, one of the building blocks for the ocean food web. Deoxygenation also causes increased algal growth, like the red tides that choked the coasts of Florida this past year and killed hundreds of manatees and tens of thousands of fish. A related issue in the Arctic also appears to be another emerging threat. According to the just-released “Horizon Scan of Emerging Issues for Global Conservation in 2019” (the tenth annual edition of this study), climate-change induced release of carbon from polar ice will further worsen global warming, while the release of mercury from thawing permafrost will create a toxic threat for animals, plants and soil. Meanwhile, on top of the obvious weather-related changes, climate change could create an additional unexpected threat to some species: wildlife trafficking. “Some species will undoubtedly decline as a result of climate change, making them rarer and thus potentially even more desirable by those who trade in them,” explains Richard Thomas, global communications coordinator for TRAFFIC, the anti-wildlife-trafficking organization. “Addressing wildlife trade issues and promoting sustainable harvesting are likely to become more important than ever,” he says. The (tiny) bit of good news related to climate change? Because so many scientists are studying it, we’re learning more and more about its effects. “I think research showing when, where and how species are able to adapt to some changes is promising,” says amphibian biologist Karen Lips of the University of Maryland. The more we know about exactly how climate change threatens certain species — or about how they can adapt to it — the better we can do at protecting them from extinction. Among the greatest threats to wildlife are the Trump administration and similar politicians around the world, such as Brazil’s new far-right president, Jair Bolsonaro, who took office this month and immediately moved to undermine indigenous rights in his country. Mayer adds that the recent election in Madagascar could be just as bad. Former president Andry Rajoelina, whose previous tenure was marked by a dramatic increase in illegal logging, deforestation and biodiversity loss, was reelected last month, although as of press time the election remains mired in protests and accusations of fraud. 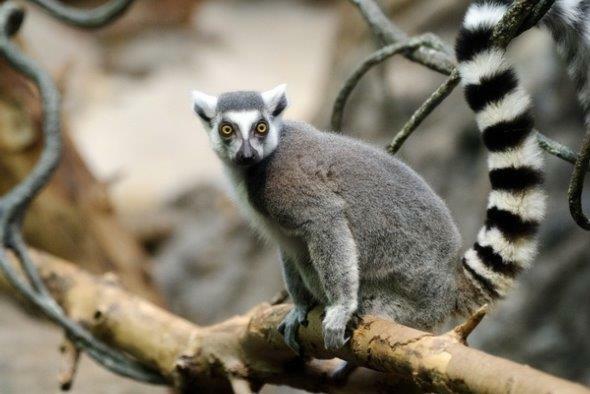 “The risk of losing the amazing biodiversity of Madagascar is always a big story. We hope that the situation there doesn’t get worse and that there is a chance for improvement,” Mayer says. Getting back to the Trump administration, many experts worried about how things will play out for this country’s wildlife in the year ahead. “The federal government is shirking its duty to protect species and commit to conservation programs,” says Johnson of the Union of Concerned Scientists, who points to three potential rule changes would diminish the effectiveness of the Endangered Species Act and other conservation regulations, among many other attacks against the laws. “This, in addition to funding cuts for species listings, will put a strain on conservation efforts,” she says. Johnson expects funding to remain an issue in 2019, as will further attacks against the Endangered Species Act. Indeed, that may have also helped inspire last November’s “blue wave,” the newly elected officials from which took office this month. Many of our experts expressed cautious optimism about these new government representatives. But outside of Washington, things are speeding up. New road and infrastructure projects, many backed by Chinese investment, are currently being carved into critical habitats in Indonesia, Africa, the Amazon and other regions. Much of this stems from China’s Belt and Road Initiative, a development strategy to build extractive industries in 70 nations around the globe along with overland roads, ports, railways and pipelines to exploit them. “We’re experiencing an avalanche of new infrastructure projects,” says Laurance, who points out that the Initiative has at least 7,000 developments planned or underway. One of the most notorious projects is a gigantic hydroelectric dam that could wipe out the newly discovered Tapanuli orangutan (Pongo tapanuliensis) in Sumatra. Meanwhile, a similar — if not even more extensive — proliferation of illegal roads is being constructed around the world by loggers, miners, poachers and other extractive industries. These activities threaten everything from elephants and tigers to insects and rare plants. One big problem is that conservationists don’t always know where these roads — legal or otherwise — are being built, and without that information it’s impossible to protect species from development. “It’s actually really difficult to try to get even basic maps of where roads are,” Laurance says. Right now he and his team pore over satellite images by hand, looking for signs of new disturbance — not an easy prospect when images vary by surface, shadowing and other factors. “Our group has spent something like a thousand hours trying to map these roads,” he says. Laurance has issued a call for help to develop a software tool to automate the road-discovery process. “We’ve got an urgent need to detect the roads and tell governments, look, here’s where there’s illegal activity,” he says. Without that, conservation — and species — will lose ground every day. “The bottom line is we need to be able to keep track of roads in real-time, on a global scale, and especially in developing countries,” he says. Most countries haven’t come close to that goal yet. Many of the experts we spoke with expressed hope that the tight deadline will result in some good, quick land and water protection that could protect countless species, but cautioned that these efforts should be watched carefully to make sure they truly protect key habitats and that they offer connectivity between disparate species populations. The oceans will also be a big part of the Aichi targets. “You’ll probably see a lot of new, large marine protected areas established in the next year,” says Shiffman. He cautions, though, that some of these could be established in places where there’s no fish or other species to protect, or no system in place in which to protect what’s there. “They could end up being paper parks — parks in name only,” he says. Here are a few more factors predicted to play a big role in 2019. Understanding the effects of plastic waste is crucial. First, we continue to learn more about how plastic waste affects wildlife and the environment. Most recently, a study found that 100 percent of sea turtles had plastic or microplastics in their digestive systems. With more and more plastic being produced every day, this will be a major focus of research and conservation the coming year. Meanwhile many experts also expressed fear about emerging diseases, like those affecting bats, frogs and salamanders. Lips also noted that it’s often hard to get funding and other support for these growing problems because they’re less in the public eye. “People and the media tend to focus on the current emergencies rather than the slow, long-term problems because we are not very good at maintaining focus and attention,” she says. The threats of poaching, snaring and wildlife trafficking will also remain significant around the world, as the forests of southeast Asia and the plains of southern Africa became emptied of their animal life and as “valued” species such as tigers, rhinos and pangolins face ever-increasing pressures. Right now this activity is all illegal, but that could change in the blink of a pen stroke. “We need to watch out for the pro-trade agenda” like this past year’s attempt by China to legalize the medicinal trade in rhino horns and tiger parts, cautioned Rhishja Cota, founder of the wildlife advocacy organization Annamiticus. This may also mean keeping an eye out on the Trump administration’s continuing efforts to promote big-game hunting and resulting trophy imports by its wealthy patrons. Finally, as habitats shrink and poaching and other threats take their toll, a growing number of species are likely to benefit from last-gasp captive breeding, either to boost their wild populations or to keep them alive once their habitats have disappeared. The red wolf and Florida grasshopper sparrow captive-breeding programs may save those species from extinction in 2019. Another species starting the year off on better footing is one of the world’s rarest birds, a duck called the Madagascar pochard (Aythya innotata), just returned to the wild after 15 years thanks to a captive-breeding program in Scotland, of all places. Other incredibly rare species likely to benefit from similar programs this year include the Sumatran rhino (Dicerorhinus sumatrensis) and maybe even the rarely seen saola (Pseudoryx nghetinhensis). The year 2019 has just barely begun, but experts warn us that the opportunity to make a difference on these issues is already running short. For 50 years the Land and Water Conservation Fund has helped support thousands of projects across the country.